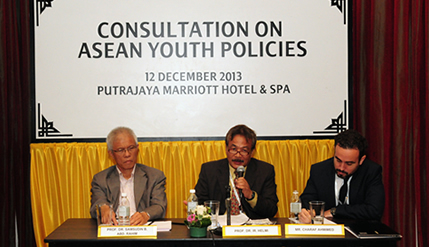 PUTRAJAYA, 12 Dec 2013 – Youths of the Association of South-East Nations have become more assertive and want the respective governments to properly address the issues of jobs, education and individual rights. Some 25 Academic representatives from ASEAN countries said young people are demanding more say in government policies because they are directly affected by decisions now and in the future. In the one-day round-table consultative session organised by The National University of Malaysia (UKM), they concluded that ASEAN should be committed and responsible to its people, especially youths as civil society is an important component in helping the region in accomplishing its goals. The Consultation On ASEAN Youth Policies was commissioned by the United Nations Education Scientific and Cultural Organisation (UNESCO) with the help of UKM’s Institute of Malaysian and International Studies (IKMAS). They advised ASEAN to set up an independent regional body participated by youths to actively engage the youth policy planning, monitoring and reform. The entity should be involved in strategic transparency and accountability measures on education, employment, public health and sustainable environment at local and national levels. Present at the roundtable consultations were UNESCO National Programme Officer in Asia and the Pacific in Bangkok Sarinya Sophia and UNESCO Jakarta Programme Specialist Charaf Ahmimed. There were also nine representatives from the Youth and Sports Ministry. IKMAS Director Prof Dr Rashilla Ramli, in her opening remarks, said the proposals would be forwarded to the 2014 ASEAN Youth Ministerial conference for deliberation. Among the consultative panel members were Prof Dr Samsudin Rahim, director of UKM’s youth empowerment centre PERKASA, and Datuk Dr Denison Jayasooria, principal research fellow at the Institute of Ethnic Studies. They said youths in Malaysia felt marginalised and wanted more say in economic policies so that they can have a better future. Prof Samsudin pointed out that the jobs are harder to come by and in Malaysia the unemployment rate among people aged between 15 to 24 is at 3.8%, which is higher than the national average of 11.3%. He explained that since most large-scale youth activities are organised by the government, young people want the authorities to consider their grievances first before making decisions that change their lives. Datuk Dr Denison, who has worked extensively with non-governmental organisations (NGO), urged government to set up some sort of a grievance mechanism so that their feedback can be collected. Another panelist the deputy dean (Research and Innovation) of the Faculty of Social Sciences and Humanities Assoc Professor Dr. Noraini Ibrahim said the rural to urban and inter-ASEAN workers migration have greatly impacted the availability of jobs for local youths. She urged the authorities to focus on education that would make it easier for youths to secure jobs. The governments in those countries should play a more crucial role in improving the lives of ASEAN citizens, especially fully recognising the rights and issues of young people. Panelists also expressed concern that education is still not accesible to all youths. They agreed that high unemployment among the younger generation can trigger violence.